This Excel Add-in for www.tpschecker.co.uk will add a TPS screening option to your Excel menu that will allow you to screen numbers against the TPS, CTPS and FPS quickly and efficiently at the click of a button. This Excel Add-in will work with Excel versions 2007, 2010 and 2013. If your system does not have the appropriate Microsoft .NET software installed already, the install process will automatically install it for you. This version is currently only available for www.tpschecker.co.uk users. 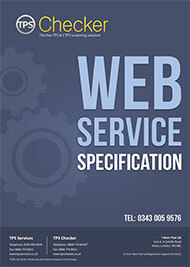 A version for www.tpsservices.co.uk users is currently in development. 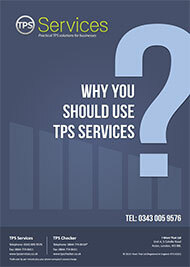 This very simple and straight forward brochure explains why TPS Services is different from many other organisations offering TPS Screening services and why we feel your business would benefit from our services. This brochure explains all about why your business should be looking to check its outbound data against the Telephone Preference Service register prior to calling. It explains the legal aspects, how failing to check your data might affect your regulatory standing with the Ministry of Justice (MOJ), Financial Conduct Authority (FCA) or any Insurance AR or IAR relationship. It also gives a short background on why we provide these services. This document should contain all the information and code you require to implement systems integration with TPS Services, but if you need any assistance please contact us for support. This document details each STD code in the UK and it's geographic location. If you're looking to create campaigns based on geographic areas you might find this document helpful. We've also provided a version in Microsoft Excel (XLS) for download. The most recent guidance issued by the ICO. The first post GDPR guidance and very much worth reading. TPS Services takes data protection very seriously. If Data Protection is a concern for you then please download our Data Protection Policy and feel free to ask any questions of our team. Trust is a key factor in our business. We handle data for many claims, finance and insurance companies and without that trust we would be unable to operate. 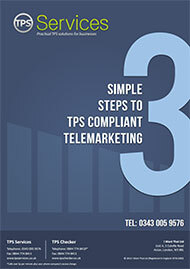 The ICO has issued guidance to firms making marketing calls, within which, how and what to screen against the Telephone Preference Service (TPS) and other registers is addressed.